Blue Wolf has announced that they have been awarded a contract from General Dynamics Land Systems to provide interior NVIS lighting for an International Light Armoured Vehicle (LAV) program. 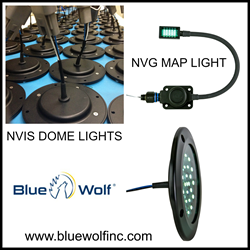 Blue Wolf's newest award will focus on manufacturing various quantities of NVIS Round Dome lights, NVIS Gooseneck Map Light, and Emergency Medical Clamp-on Gooseneck Lights. These interior lights are specifically designed for illuminating steps, instrumentation, or small cargo service areas such as those found in aircraft, tanks, boating vessels, or other special Military Night Vision use applications. Over the past two years, Blue Wolf developed these new NVIS/NVG vehicle lights, so they can withstand the extreme conditions, vibrations, and temperatures these lights go through within LAV's lifespan. In addition to being machined from durable-grade aluminium and being IP67 water rated, the 28Vdc electronics provide constant light output, transient, and over-voltage protection, full 0 to 100% PWM dimming ability, tactile feedback on the dimming knobs of the map lights, and an LED life span of more than 40,000 hours. These lights are compact and light-weight in design, durable, and require very little space to install in OEM vehicles. They have been tested to MIL-STD-810G and can be easily installed while preforming any new NVIS/NVG upgrades or standard lighting additions. With a low-power consumption of less than 2.8 Watts per unit, the lights can be connected to the 28VDC battery bus with no concerns of heavy power use. Additionally, no wires are visible with the thin NVIS Round Dome light, as the three wires pass through the back center of the light, making this installed light clean and professional looking in any panel or wall-mounted solution. "I am extremely proud of our design team, the company, and the level of customer support we provided GDLS throughout this project. Receiving this contract award is a great testimonial of Blue Wolf's full ability to engineer, design, manufacture, and deliver the next level products needed for today's mission critical vehicles," stated Blue Wolf's President, Ty Plowman.